Just announced: Blue Rodeo will perform at Lucknow’s Music In The Fields festival this summer! The band will headline the night of Friday, August 23. Other peformers at this year’s fest include Billy Currington, the James Barker Band and Kim Mitchell! Blue Rodeo has been announced as one of the headlining performers at the 2019 Regina Folk Festival, which this year celebrates its 50th anniversary! This year’s fest run August 9 to 11 at Regina’s Victoria Park. For more information and to get your tickets, please visit ReginaFolkFestival.com now! Blue Rodeo have announced they will perform at the Canalta Centre in Medicine Hat, Alberta on July 6, 2019. The BlueRodeo.com presale for this show will begin March 7 at 10am MT. A BlueRodeo.com account is needed to participate in our exclusive presales. Don’t have an account? Create one here! On March 24, Blue Rodeo will perform at the Busch Gardens Food & Wine Festival in Tampa, Florida, along with Kathleen Edwards and Fred Eaglesmith. Concert tickets are included with park admission. For more about the Food & Wine Festial, please click here. East Coast Tour Starts Thursday! 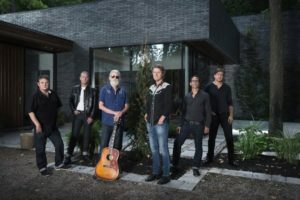 Blue Rodeo’s 2019 East Coast tour with special guests, Skydiggers, kicks off this Thursday, February 7, in Moncton, NB. That show is sold out, but there are still tickets remaining for the rest of the dates. Visit the tour page to get yours now! Fans attending these shows will have the opportunity to purchase these lovely silk-screened posters by the amazing Jud Haynes (Jud has also designed the album art for Blue Rodeo’s last several albums). Click the image at left for a larger image, and look for them at the merch table!